We introduced our custom pouches in May, and they very quickly became some of our most popular items, for good reason! Our pouches are really affordable, and, on top of that, can be ordered in as few as 50 pieces. These pouches work well for clients who need something smaller than a gift bag, and with a higher perceived value than some of the other common bag materials. You might be on a tight budget, or not need 100 bags, or need a small carry-all for a very specific purpose. Your recipients will see your messaging every time they use their pouch, and believe it when we say they’ll see a great deal of use. These are the kinds of items that you don’t realize you need until you have them. That’s great for you, because it means your marketing dollars will be put to good use! Six of our custom pouches can be printed in full bleed at no additional charge, which allows for either a large or creative patterns. Since most of the pouches are made to order in the USA, we can also accommodate special requests from our clients! For example, we had a client who needed some custom pouches for specific branding guidelines. Since he chose a USA made pouch, he was able to dictate the size and placement of the logo, AND construct the pouches using black cotton! This project, of course, was more costly than choosing from a stock pouch size and color, but it gave him exactly what he envisioned for his store’s messaging. 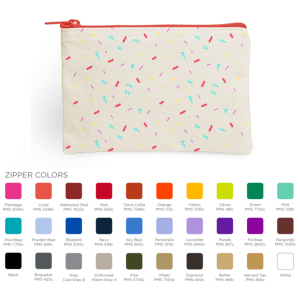 From credit cards to loose change, pencils to electronics, you’re bound to find the perfect custom pouch for whatever stuff you’re looking to store, tote, or stash. If not, you can create your own! Shop Our Custom Pouches Now!